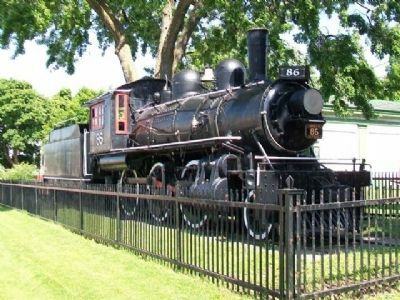 Built in 1910 for the Grand Trunk Railway by the Canadian Locomotive Company of Kingston, Ontario, and weighing 135 tons, Engine 86 is one of the last remaining 2-6-0 Mogul engines in Canada. This class of engine was designed specifically for branch line work. 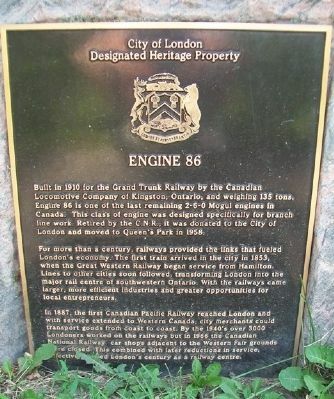 Retired by the C.N.R., it was donated to the City of London and moved to Queen's Park in 1958. For more than a century, railways provided the links that fueled London's economy. 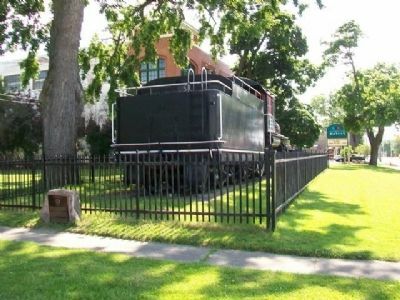 The first train arrived in the city in 1853, when the Great Western Railway began service from Hamilton. Lines to other cities soon followed, transforming London into the major rail centre of southwestern Ontario. With the railways came larger, more efficient industries and greater opportunities for local entrepreneurs. ended London's century as a railway centre. Erected by City of London. Location. 42° 59.508′ N, 81° 13.248′ W. Marker is in London, Ontario, in Middlesex County. Marker is on Dundas Street just west of Quebec Street, on the left when traveling west. Touch for map. Marker is located near the NW boundary of the Western Fair grounds. Marker is at or near this postal address: 900 Dundas Street, London, Ontario N5W 3A1, Canada. Touch for directions. Other nearby markers. At least 8 other markers are within 3 kilometers of this marker, measured as the crow flies. The East London Town Hall (approx. 0.4 kilometers away); Birthplace of Insulin (approx. 0.9 kilometers away); Birthplace of the Flame of Hope (approx. 0.9 kilometers away); Banting House (approx. 0.9 kilometers away); Harold A. Rogers, O.C., O.B.E. (approx. 1.9 kilometers away); London Armouries (approx. 2 kilometers away); London War Cenotaph (approx. 2.2 kilometers away); Veterans' Garden (approx. 2.2 kilometers away). Touch for a list and map of all markers in London. More. Search the internet for Engine 86. Credits. This page was last revised on June 16, 2016. This page originally submitted on August 4, 2014, by William Fischer, Jr. of Scranton, Pennsylvania. This page has been viewed 288 times since then and 3 times this year. Photos: 1, 2, 3. submitted on August 4, 2014, by William Fischer, Jr. of Scranton, Pennsylvania.